Whales off the California coast are becoming increasingly tangled in fishing gear. What’s being done about it? for California, Justin Viezbicke, a wiry-framed surfer with a reputation for handling these rescues with a cool head. One August evening at the Monterey Bay National Marine Sanctuary Exploration Center in Santa Cruz, Viezbicke told a crowded room that the quantity of entanglements has increased sixfold in recent years in his response region, which stretches from San Luis Obispo to Oregon. And, he says, for every entanglement that’s reported, many more are missed.The reason for this uptick in humpback entanglements is multi- faceted. For one, the humpback whale population is thriving. In 1966, when their numbers were so low researchers were lucky to see one on a given outing, humpback whaling was outlawed in U.S. waters. Prior to 1905, their numbers in the North Pacific were estimated to be 15,000, but due to whaling, that figure was down to 1,200 the year killing them become illegal, according to the National Marine Fisheries Service (NMFS). Viezbicke also cautions that it’s very difficult to get bulletproof data on quantities of entanglements due to his suspicion that people are getting much better at identification and reporting, which can account for higher numbers. 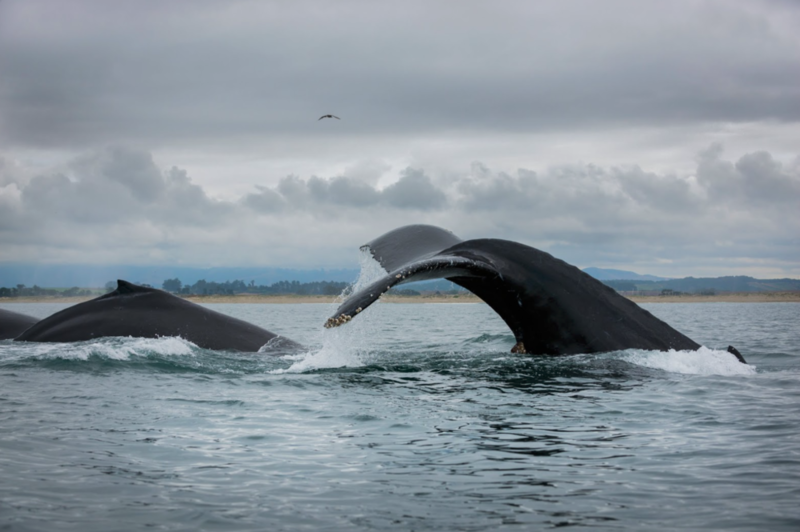 John Calambokidis, a senior research biologist and co-founder of the Cascadia Research Collective in Washington, says that the humpback population along the West Coast in the early 1990s was as low as 500. Today, the population in the same region is estimated to be closer to 2,000. A photo- identification study by the NMFS from 2004 to 2006 estimated the abundance of humpback whales in the entire Pacific Basin to be 21,808.
we think is contributing to the higher numbers, as well,” Viezbicke says. Folkens says that crab fishing in California has been increasing in recent years, which means more pots in the water during times of high whale migration. “A number of large [crab fishing] operators out of Oregon have come down into California, where there have traditionally been smaller operations, and these guys put out pots that create a gauntlet, making it very difficult for the animals to get through,” Folkens says. Justin Greenman, Viezbicke’s assistant at NOAA, says that the California Department of Fish and Wildlife and other state agencies are very aware of the increase and are working closely with NOAA to devise solutions to the problem. the fishing industry. He says that a large community of commercial fishermen has been eager to cooperate and be proactive on figuring out ways to prevent these entrapments. The general public—that’s you—can also help by keeping an eye out. To report an entangled whale, call NOAA as quickly as possible at 877-SOS-WHALE. When NOAA disentanglement teams respond to a tangled whale, they often have to attach their boat to the whale while they assess the jumble and work to undo the lines. Naturally, a humpback becomes more distressed when contact is made and will attempt to swim away. This can result in the rescuers being towed wildly for days on end. The experience is called a “Nantucket sleigh ride,” a phrase that originates from the small-boat whalers of Massachusetts who, after harpooning a whale, would be taken on a rough ride that could reach speeds up to 23 miles per hour. Thankfully, the new use of the phrase involves trying to save the whale rather than kill it. Folkens says it’s not uncommon for them to attempt to smash disentanglement rescue teams with their enormous fluke. crab pots are set. There is also an increase in commercial fishing in the Monterey Bay. Another factor is a better system for reporting the entanglements and better education outreach programs, increasing the likelihood that an oceangoer makes a report in the first place, according to Justin Viezbicke, of NOAA. Humpback whales migrate almost constantly in their search for food. The West Coast, especially the Monterey Bay, is a major feeding destination for the animals. They frequent the Bay normally between April and October, when they are often visible from the coastline. Based on a recent tagging study by Cascadia’s Research Collective in Washington, humpbacks will travel from the Channel Islands in Southern California up to the Cordell Bank National Marine Sanctuary, just north of San Francisco, several times in a single summer. 65 whales were entangled in fishing equipment so far in 2015 along the U.S. West Coast, Hawaii, and Alaska. 34 whales were entangled in fishing equipment along California this year, as of August. 20 of them were humpbacks. 18 of the entanglements occurred in the Monterey Bay. Our world produces such massive quantities of plastic waste that it often flows into our oceans, where it has amassed into colossal “garbage patches.” What will it take to fix the problem? In October of last year, local surfer Danny Wright embarked with a friend on a six-month road trip from the Monterey Bay down through Mexico, across four Central American countries, and into Costa Rica. eventually enter off-shore currents and float into the sea. There is no better way to grasp the gravity of plastic pollution than by taking a look at the “Great Pacific Garbage Patch,” or GPGP—a fluid area, described by some as twice the size of Texas, between California and Hawaii where millions of tons of marine debris float in the ocean currents’ convergence zone, a feature known as a gyre. Each year, approximately eight million metric tons of plastic litter makes its way into the ocean, where it will eventually drift into one of five gyres around the planet, according to a recent study by the University of Georgia. The author compares that figure to putting five plastic grocery bags full of more plastic on every foot of coastline in the world. The North Pacific Gyre, the site of GPGP, is the planet’s largest such vortex, containing roughly 3.5 million tons of trash, 90 percent of which is plastic debris, according to Santa Cruz- based nonprofit Save Our Shores. Many people think of this patch as something sturdy and definable— something you could walk on or crash a ship into. In reality, the majority of it is very small plastic pieces, distributed at different depths, that float like confetti in the water. This makes it more like a plastic soup than a “patch.” While this may seem like a better scenario than solid plastic waste, it means the pieces are easily consumed by sea life and makes the prospect of cleanup much more complicated. So, in a country where the average person tosses out 185 pounds of plastic every year, according to Ecowatch.com—50 percent of which was only used once—where does fixing the problem begin? Removing the plastic waste from the GPGP has been deemed impossible by many researchers, who say it would cost many billions of dollars, hundreds of years, and so much ship fuel that the emissions would likely cancel out the cleanup benefits. Dianna Parker, of NOAA’s national Marine Debris Program, explains that studies have calculated that it would require 67 ships one year to simply survey the area of the GPGP at a cost of about $498 million. Plus, because so many of the plastic pieces are so tiny and scattered at various depths, recovering them would be extremely complicated and likely result in staggering by-catch (many organisms have actually attached themselves to plastic particles, further complicating matters). One project that has become a beacon of hope for some—including Wright— and the source of skepticism for others, is The Ocean Cleanup organization, which was founded by a young Dutchman named Boyan Slat. Last year, the organization completed a feasibility study with more than 100 experts on engineering, oceanography, ecology, maritime law, finance and recycling. The concept, which was judged viable, uses ocean currents and winds to passively transport plastic toward a collection platform, saving massive amounts of fuel as well as eliminating the need for nets that could entangle sea life. The Ocean Cleanup posits that after deploying the system for 10 years, almost half of the plastic in the GPGP could be removed. “I think this is one of the best chances we have at cleaning up the garbage patch,” Wright says. Cleaning the patch up is all well and good, says Parker, but won’t matter much if the problem of plastic production isn’t tackled. She compares that oversight to drawing a bath in a tub with its drain plugged and, as the water brimmed and overflowed onto the floor, attempting to scoop the water up using a spoon without ever stopping the faucet. Wright’s road trip into Central America got him thinking about recycling incentives. He says the fundamental change that needs to occur is to establish systems for recycling plastic waste that generate revenue and create jobs, especially in Latin America. Plastics are recovered from landfills, a “complex waste stream,” at a rate of less than 10 percent, while metals, such as steel and aluminum, are recovered at a rate closer to 90 percent. However, on a cost per weight basis, plastic is significantly more valuable than the metal, according to MBA Polymers, a company in Richmond, Calif. specializing in plastics recycling. petroleum), and reduces carbon emissions. And though the company’s plants are based overseas and operate on a small scale relative to “virgin plastic” manufacturing and plastic waste output, the system is a viable template for closing the supply loop and keeping this meddlesome material out of the ocean. Another technology that bodes well for plastic waste prevention is the ability to convert plastic waste—things like milk jugs, water bottles, and plastic bags —into clean, ultra-low sulphur liquid fuel. Captain Jim “Homer” Holm, the founder and executive director of Santa Cruz’s The Clean Oceans Project, says that propelling an industry around the conversion of plastic-to-fuel will get people to start thinking about plastic leftovers as a profitable material and not just as something to be thrown away and forgotten about. He believes, like Wright, that people’s motivation to make a dollar has a better shot at changing the way society thinks about the plastic waste than altruistic environmental concerns. There’s no way out of this problem without changing how we consume and discard plastic materials in the first place. It is the daily consumer’s plastic waste stream that seems so minuscule on an individual basis, but in reality adds up greatly. For example, it is estimated that Americans use more than 182 billion plastic straws per year—enough to fill up Yankee Stadium nine times over. Hays carries a mason jar for drinking, shops at farmers’ markets with reusable bags, buys in bulk, declines plastic straws, and composts to eliminate the need for plastic garbage bags. Still, Rachel Kippen, program manager for Save Our Shores, explains that no single tactic will solve or truly stem the plastic contamination problem. To truly change the way plastic waste is contaminating the planet, everyone— individuals, nonprofits, government, and researchers—must tackle the problem from their own vantage point, she explains. Making that change will have to include educational campaigns, policy changes and legislation, as well as new research, innovative thinkers, and funding for diversion and cleanups. Home in Santa Cruz, Wright is still haunted by foreign beach breaks tainted by plastic trash, but holds out hope that people will realize what is happening to the ocean and strive to be part of the solution. Article from Live the lifestyle Volume 2.2 – June / July 2015, “Environment”. Jack O’Neill, the inventor of the surfing wetsuit, a sailor, wave-rider, and former hot-air ballooner, is 92 years old. His life’s work tells a tale of the evolution of surfing, while his memories tell the story of a man with a life well lived. During the last week of March 1964, a 9.2 earthquake shook Alaska to its core, causing a massive tsunami to travel across the North Pacific. One of the biggest swells to ever hit the West Coast rose up out of the sea, sending 25- foot blue-water giants rolling across Third Reef and Steamer Lane, where just a few brave Santa Cruz surfers paddled out for the inside lineup. The waves were so ferocious that the entire San Francisco Bay was shut down —tanker ships were directed back out to sea—while closeout sets pummeled the Santa Cruz harbor entrance at the jetty. …was light that day, underscoring the power of the swell, and 41- year-old Jack O’Neill—still seven years away from the surf injury that would leave him with the iconic black patch over his left eye—was sailing his Pacific Catamaran, or “P-Cat,” just off of Lighthouse Point, making a line into position for an inconceivable takeoff on one of the mountains of water piling high on the far outside. Jack recalled the adventure one recent morning over cups of tea at his East Cliff Drive home. From his seat on the living room sofa, he has an up-close view of the 50 or so surfers enjoying a 4- to 5-foot swell rolling in just below at Pleasure Point. The icon who changed the way people experience the ocean—first by inventing and fine-tuning the neoprene surfing wetsuit during 1950s and later by helping usher in foam-core surfboards—is now 92 years old. And as he ages, his legacy of shaping the surf industry, as well as the culture that envelops it, seems to stretch on forever, permeating almost every aspect of the sport’s mainland history. Now, as I leisurely observe Jack in his beachfront dwelling—barefoot and wearing black sweat pants and an old black, long-sleeve O’Neill T-shirt—it’s clear that every part of his life has in one way or another been tied to his love for the sea. Jack, one could argue, is a true waterman—a term that is thrown around too loosely today, says Brian Kilpatrick, the O’Neill company’s vice president of marketing communications. Jack and Wally swept down the face of that wave, which he estimates stood about 25 feet high, and pulled hard on the tiller to steer the boat to the right in an attempt to surf the wall of water. But the rudders were no match for the tsunami’s surge—both of them, crafted from 14 layers of fiberglass, snapped off like twigs. Jack and son Pat OʼNeill give 1977 surfing world champion Shaun Tomson (center) a tour of the Monterey Bay. at Steamer Lane and CEO of the O’Neill company for the past 30 years—was watching his dad from the cliff at Lighthouse Point. As Pat watched the P-Cat lose control at the base of the wave, he recalls a photographer next to him missing all the action as he reloaded the film on his 16-millimeter camera. The boat spun out but popped through the back of the white water, still intact, and Jack and Wally emerged unscathed. In a moment of ingenuity, Jack and Wally filled the stern compartments of the P-Cat with seawater, causing the rear of the boat to sink deeper, pushing the remains of the rudders downward and giving Jack the ability to steer the boat back to port. It wasn’t the first time Jack took a sailboat surfing. In fact, he was already known for trying to pull into big swell at Steamer Lane. Like most activities related to the ocean, sailing has been a lifelong passion for Jack, one which he imparted to his family early on. In 1974, not long after his first wife passed away, Jack moved with three of his children onto a 60- foot, full-gaff-rigged schooner named the Marie Celine, for a years-long journey to Mexico and back. Pat and sister Cathi O’Neill stayed behind to run the company. As author and close family friend Drew Kampion documented in his biography of Jack, It’s Always Summer on the Inside, that sail south was both about healing from their loss and expanding their horizons. The family also has many fond memories of Wednesday night sailing races in Santa Cruz, when Pat recalls how their full-keel, 22-foot, open-cockpit boat could cut across the kelp beds off of Blacks Point, giving them an extra edge on the race course. Jack’s initiation into ballooning quickly became intertwined with his passion for boats and the ocean. He began flying his balloon off of Steamer Lane during the summer, when warm winds would blow him out over the sea, and then, as evening set in, the wind would shift into an easterly and bring him back toward dry land—at least in theory. “It never really took me in the right direction,” he says. By 1968 he was launching balloons off of boats on the Monterey Bay and experimenting with different flight takeoff and landing techniques. At this point in our conversation, Jack and I begin watching home video on his laptop of a crew aboard the O’Neill catamaran when it was new, around 1983, scampering around the deck helping to launch Jack into the sky aboard his single-man hot air balloon. He was the first to pull off that maneuver, as well. Even with so much adventure, innovation and business success on his resume, Jack says that the work he is most proud of is the O’Neill Sea Odyssey program. The nonprofit provides fourth, fifth and sixth graders with educational sailing experiences on the Monterey Bay aboard the 65-foot O’Neill Sea Odyssey catamaran—the same boat Jack used to launch hot-air balloons off of. The program, which began in 1996, teaches students the values of ocean conservation by getting them out on the water at no charge to their schools. Jack pictured with students aboard the OʼNeill Sea Odyssey. To date, O’Neill Sea Odyssey has brought more than 75,000 kids onto the ocean. Jack says that he has a vision for a new program that would offer sea outings for young people transitioning out of juvenile hall. Pat is also very proud of the opportunities O’Neill Sea Odyssey has provided for so many kids. He sees it as a way to help spread the love for the ocean that he was raised with thanks to his old man. Pat has followed closely in his father’s footsteps, now serving as the head of the O’Neill company. He cut his teeth in the surf industry early on, learning from his dad and on his own in the water. By the time he was a high school sophomore he was working a night crew on 41st Avenue making wetsuits, and went on to work as the West Coast O’Neill sales rep after high school. He is also known for having charged as a top member of the O’Neill Surf team and developing the first surf leash prototype in 1970. Still, the younger O’Neill credits his father as the man whose vision changed everything. A CLASSIC CONTEST: The O’Neill Coldwater Classic Invitational surf competition will be held Oct. 13 – 17 at Steamer Lane. The longest-running surf contest in Northern California, the CWC had its first year in 1987. Thanks to the event, Steamer Lane has hosted many of the best surfers in the world. 1952: The original O’Neill outlet, named “Surf Shop,” opens in San Francisco, where Jack begins shaping and repairing balsa wood surfboards. 1956: Jack creates and markets the first neoprene wetsuit prototype: the beavertail jacket. 1959: Jack moves the Surf Shop next to Cowell Beach in Santa Cruz, where surf culture was proliferating. 1964: Jack organizes the O’Neill surf team, providing the most talented surfers in Santa Cruz with new surfboards, that they would in turn provide feedback on. 1970: After Jack began piloting a hot air balloon over the Monterey Bay, and landing in the water numerous times, he was inspired to design the SuperSuit. The SuperSuit was a wetsuit design that the wearer could inflate by blowing air into it and float in the ocean for extended periods of time. About five years later, the U.S. Navy would acquire the same technology for their free-swimming suit. 1970: Pat O’Neill designs the modern surfboard leash, using bungee cord and a suction cup. wave, it snapped the board back and into his eye. 1996: Jack launches the O’Neill Sea Odyssey program, taking kids out on the catamaran to teach them about ocean conservation. Article from Live the lifestyle Volume 2.2 – Aug / Sept 2015, “Local Legend”.